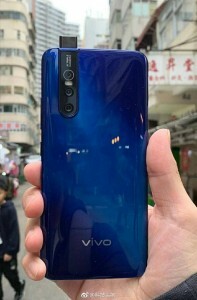 vivo's upcoming V15 Pro is in the news a lot these days, whether through leaks or official teasers coming out. The phone will be unveiled on February 20, so there's just a little more waiting you need to do if you're interested in all of the official details. In the past we've seen a black/red gradient hue being handled as well, so clearly vivo has focused a lot on this aspect of the phone's design. The V15 Pro is expected to have the Snapdragon 675 chipset at the helm, a 48 MP main rear camera, a 6.4" FHD+ Super AMOLED touchscreen with an in-display fingerprint sensor, 6GB of RAM, 128GB of storage, and a 3,700 mAh battery. usually i will only looks at middle placement camera phone. this is the only 1 that on side that looks pretty. way to go vivo. One thing to say... Wauvvv a beautiful color. Its the most beautiful blue color i ever seen on a smartphone. But actually i dont care colors when i buy phones, i always use flip covers.